Cabbage is a great bowel cleanser. I use it often as part of my Naturopathic protocols in treating various gut issues and it’s always a happy recommendation for my detox programs. It holds two essential minerals – chlorine and sulfur, which are effective in treating GI problems such as bloating, GERD or acid reflux, and indigestion. It also contains a wealth of anti-inflammatory nutrients such as polyphenols and sulforaphane and vitamins K1 and B-vitamins. Vitamin K1 is a fat-soluble vitamin most well known for the important role it plays in blood clotting and bone metabolism, but it’s also a known brain nutrient for helping to limit neuron damage in the brain. Most notably, cabbage contains tartaric acid which hinders conversion of sugar and carbohydrates into fat. When my patients tell me that they are any sort of antacids such as Pepcid or Pepto Bismol, I immediately recommend cabbage juice instead. The reason is that the juice of a cabbage is one of the most healing nutrients for ulcer repair as it is a huge source of vitamin U (which is actually not a vitamin but an enzyme known as S methylmethionine). 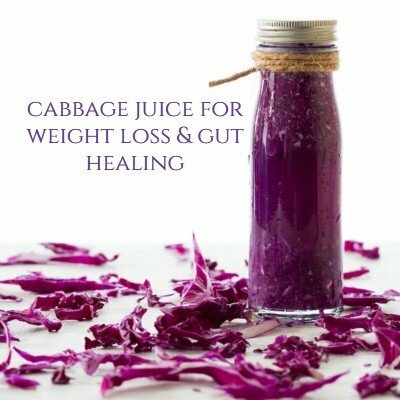 As a matter of fact, having a few teaspoons of cabbage juice before eating, or better yet, fermented cabbage juice from sauerkraut will do wonders to improve your digestion. So it not only help heal ulcers but also helps to benefit digestion. The second ingredient in my Detox-Alkaline Juice Shot is honey. Honey is known to mobilize extra fat in the body which it puts into circulation to be converted into energy. Contrary to popular belief, honey is not pure fructose. It contains trace enzymes, minerals, vitamins, and amino acids allowing it to have antibacterial properties as well. One of the reasons you’ll find it in many cough remedies. And finally, the third ingredient in my Detox-Alkaline Juice Shot is lemon. It’s the perfect way to hydrate and alkalize the body. It has a very high amount of vitamin C which helps to boost the immune system but also minerals such as calcium and magnesium which make the juice alkaline as soon as it comes in contact with your blood.